There are at least two stories within “The Imitation Game” that, by themselves, would make for gripping films. There is Alan Turing the maths genius (the English add an ‘s’ to math, for some reason), and there is Alan Turing the closeted homosexual, in a country where being gay is illegal. Since it is difficult to secure funding for any movie, the obvious choice, of course, is to combine these two massive plots to make one hell of a film. There are times when the two stories get in the way of one another, but thanks to a cracking script and superb performances by Benedict Cumberbatch and Keira Knightley, “The Imitation Game” gives “A Beautiful Mind” a run for its money in the “damaged genius period piece” genre, assuming there is such a thing. 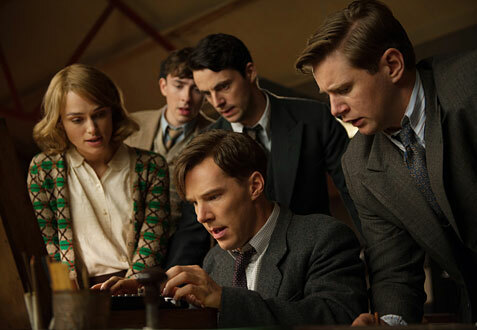 World War II is in full swing, and Alan Turing (Cumberbatch), a Cambridge maths professor, applies for a job with the British military because they need code breakers, and Turing is convinced that he is the brightest mind they will ever find. 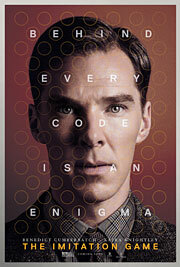 Despite bombing the interview in spectacular fashion, Turing is recruited to join a team of math geniuses. Their task: break the Enigma code, the German encryption tool that is sent out on open airwaves but is so complex that no one has been able to solve it. (Turing’s team even has an Enigma machine, but the code is so dense that it is of no use.) Turing pulls some unpopular moves to put himself in charge of the group, but eventually earns the group’s respect. His commanding officer (Charles Dance), however, needs results, and because of the aforementioned bad interview, he’s looking for a reason to shut Turing’s program down. In comes plucky Joan Clarke (Knightley), who has the misfortune of being a female good at maths. Turing, naturally, bonds with her instantly, since they are both outcasts. Turing and Clarke do amazing things together, and just when they think it’s time to celebrate, that is when they realize that they have a whole new set of decisions to make, and they are far more difficult than the previous set of problems that faced them. Did I say that there are two stories here? There are actually closer to five. You have Turing the maths genius; Turing the targeted homosexual and/or Communist; Clarke the mold-breaking female daring to do something other than secretarial work; the spy in their midst; and the stone-cold reality of actually solving the problem at hand, but then having to make horrific choices that send innocent people to their deaths in order to prevent the Nazis from realizing that the Allies have cracked the code. It’s that last one that gets the shortest shrift, which makes sense given the timing of everything, but is the bitterest pill to swallow because damn, that is a Faustian bargain if ever there was one, and it is rife with dramatic potential. Most people know Cumberbatch as Sherlock in “Sherlock” or Khan in “Star Trek Into Darkness,” both alpha males beyond compare, which is what makes his performance here such a treat. Like Sherlock, his Turing is clearly the smartest man in the room, yet his body betrays his intellectual superiority at every opportunity, thanks to the occasional stutter and the reluctance to make eye contact. By comparison, the hardest thing Knightley has to do is look plain while suffering the chauvinists all around her. (She actually looks fantastic as a plain Joan, as it were, and delivers great work in the process.) Dance is the perfect foil for Cumberbatch, one who loathes Turing but honors the chain of command, even when it instructs him to let Turing have his way. The rest of the maths geniuses do not leave much of an impression, though Mark Strong is solid in a brief supporting role as the puppet master behind the code-breaking team. Even though each day in “The Imitation Game” is its own ticking clock – the team needs to crack each code by midnight, otherwise their work for the day is worthless – the film itself is not dripping with tension, and that is actually a good thing. After all, there are more than enough stories within this story to keep the audience engaged, and Graham Moore’s screenplay, with only a handful of exceptions, does a masterful job of spreading the wealth so that each story, and as a result, each character, gets the right amount of screen time. It’s an exceptional piece of work, while serving as a commentary of how the fight for human rights is still very much in its infancy, and how far we still have to go. If you’re assembling a pre-Academy Awards must-see list, this absolutely needs to be on it.